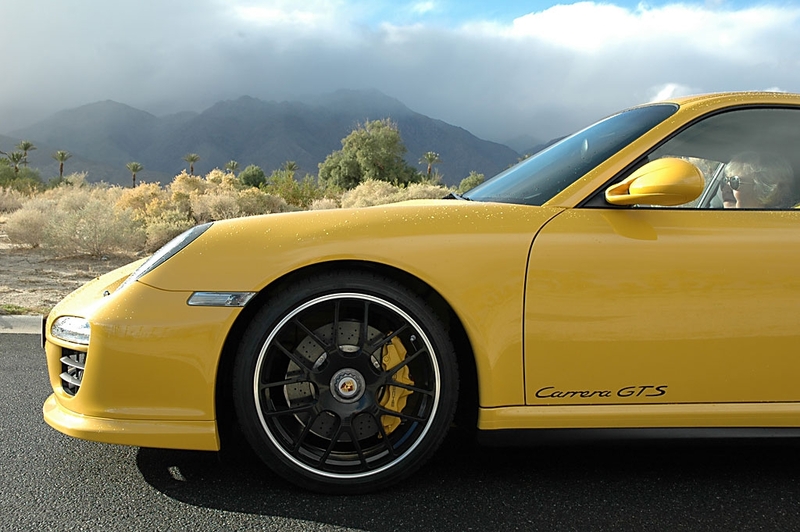 PALM SPRINGS, CA - November 21, 2010: Those who have ever driven a Porsche 911 know that it is a lovely sports car. The current 911 Carrera S is excellent and the lightweight GT3 is amazingly fast, while the Turbo beats the pace of the others. But there is more. In Paris, Porsche presented the 911 Carrera GTS, a new model in between the standard S and the GT3. 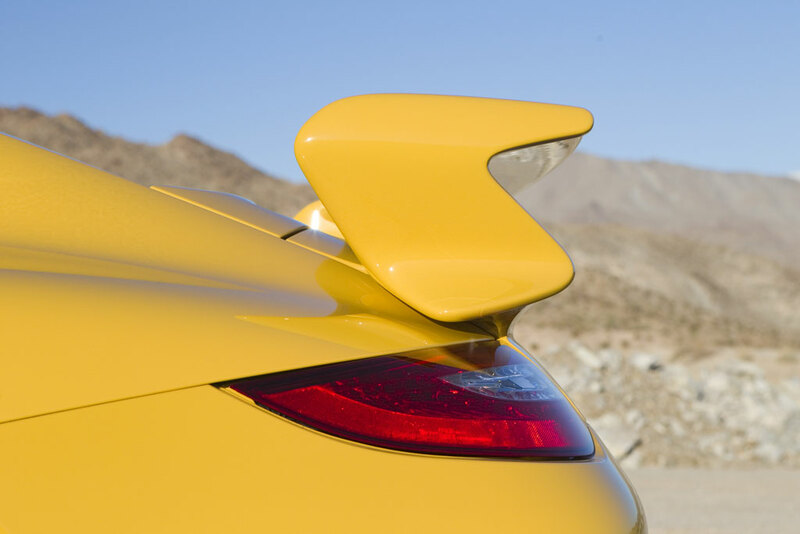 In fact, the GTS, available this winter as coupe and convertible, is meant for customers that use the GT3 for weekend racing, but find it too brutal for daily driving, but would prefer somewhat more performance than the 385 horses of the Carrera S. But also other customers will be attracted to the GTS, because of its 410 hp strong engine and the possibility to order the car with PDK, the DoppelKopplungsgetriebe, or double clutch transmission that is no option for the GT3 and do not want to wait until the new generation of the 911 arrives in 2012. Indeed, around that time we may expect the new model, even though nobody within Porsche says a single word about it. But it is not hard to figure out the model strategy of the German sports car manufacturer. Some every six years, the then current 911 gets its final special editions. In this case they are called the GTS and the Speedster. So now, the 2011 GTS made its North American debut at the LA Auto Show, together with the limited edition 911 Speedster. Just two days after the show opened its doors for the media, I was in Palm Springs to drive them both. The preceding night, I choose to drive a yellow GTS Coupe on the mountain route to Borrego Springs and back along the Salton Sea. The coupe indeed, because the Convertible did not seem a good option, since menacing dark clouds were developing over Mount San Jacinto and the weather forecast for the next day predicted rain. 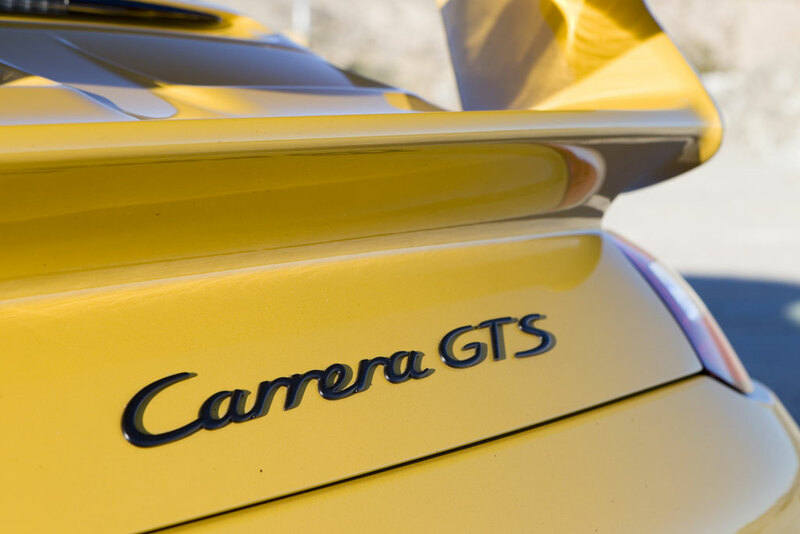 The GTS is the first badge with that name for the 911 line-up. A couple of years ago, Porsche introduced the Cayenne Gran Turismo Sport model for the variant with the 400 hp strong V-8. 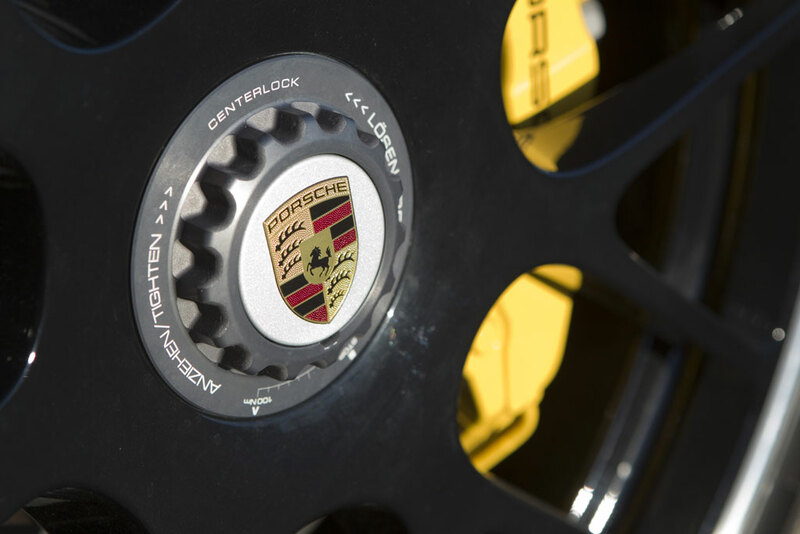 We may expect it to see the badge appear on other high performance Porsches in the future. 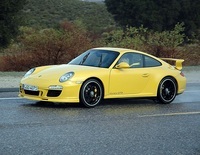 The GTS combines the 3.8-liter six-cylinder boxer engine, rear-wheel drive and the Carrera 4 AWD’s 44 mm (1.73 in.) wider body’s rear end and a wider track, also accommodating increased fuel tank capacity of 67 liters, or 17.7 gallon, or the optional larger tank (23.7 gal.). The front end with the black lip underneath is taken from the sport design package and the side skirts are the same as on the GT2. The wheels with the center mount hub are standard for the GTS. 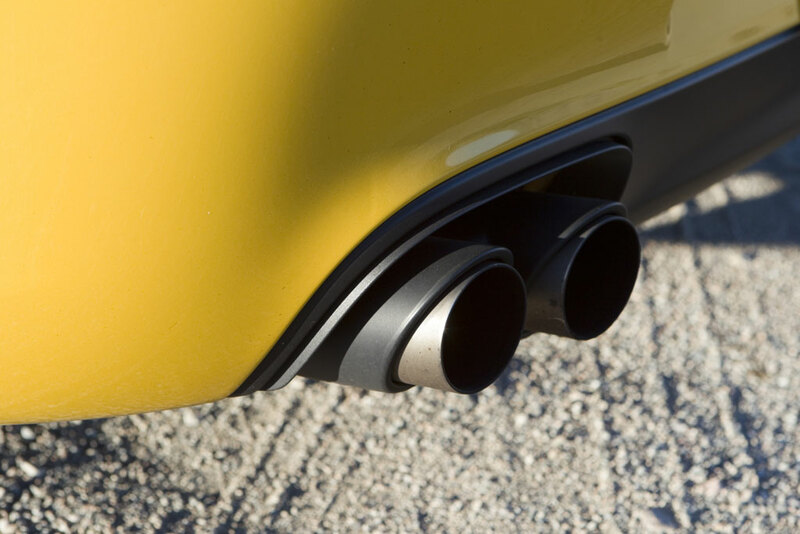 The tips of the exhaust pipes are coated inside. 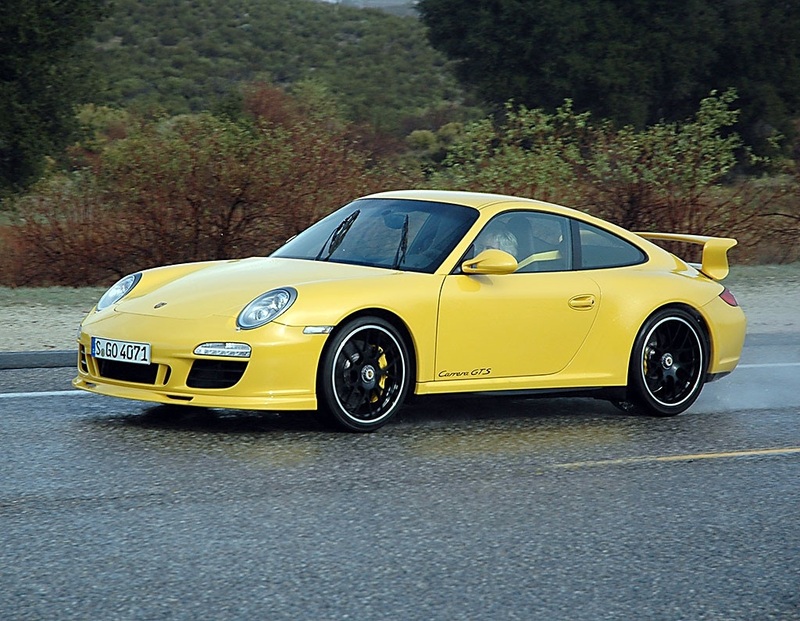 With power output up 23 hp to 408 hp (320 kW) at 7,300 rpm, the gap with the GT3’s 435 hp is narrowing. 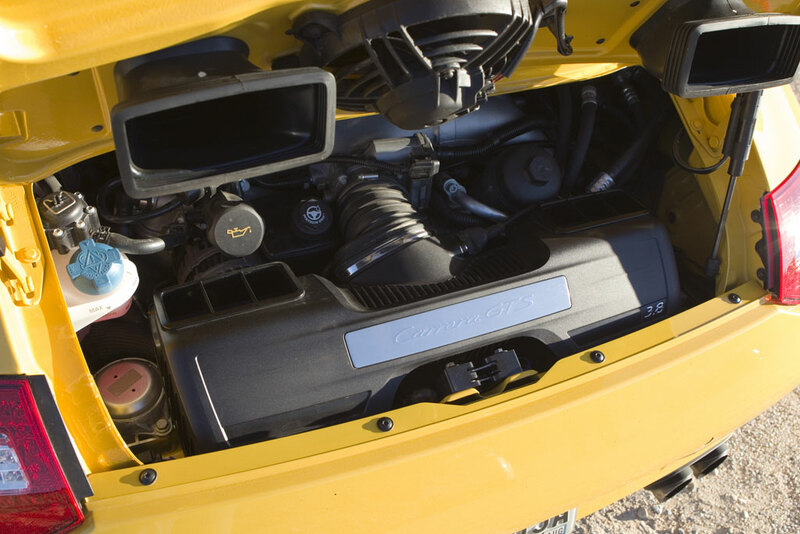 The GTS engine’s torque is wider spread, but remains unchanged at 420 Nm. Also unchanged is the top speed of 190 mph, while acceleration from 0-62 mph is down to 4.6 seconds for the GTS with the six-speed manual and 4.4 s with the optional PDK transmission. Fuel consumption remains the same as that of the S with 26.2 mpg imp (combined). A day at the helm of the GTS proves that the Porsche engineers have done an excellent job in upgrading and refining the Carrera S. The route with nice bends going up and down the mountain passes was inspiring enough to make the most of the first drive with the new variant. The steering is communicative, sensitive and the feel is firm. That also applies to the chassis, while the lack of bodyroll. Its wide stance and fat rubber of 235/3 ZR19 up front and 305/30 ZR19 at the rear provides a very stable feel. The smooth and immediately responding engine combined with the extremely fast shifting PDK transmission is a perfect combination for rocket like acceleration. It was impossible to test the handling of the GTS at its limits, because they are too high for public American roads and highways. But believe me, even on the wet mountain highways, the Porsche gives no sign of understeer, which is normally there with an engine placed behind the rear axle and less weight in the front. Nor is there any indication of movement of the back when pushing hard through bends. The car always feels confident and safe, making you want to go faster and brake later. The feel is supreme and the GTS feels like glued to the road. The yellow GTS that I drove was a special variant with the aerodynamic package, meaning a serious spoiler in the rear, ceramic composite brakes with yellow colored calipers, instead of the red ones of the standard GTS. Also the chassis is 10 mm (0.4 in.) lower. With standard PASM electronic damping, the chassis of the GTS is already 10 mm lower than that of the Carrera S, making it with the aeropackage option 20 mm (0.8 inch) lower. 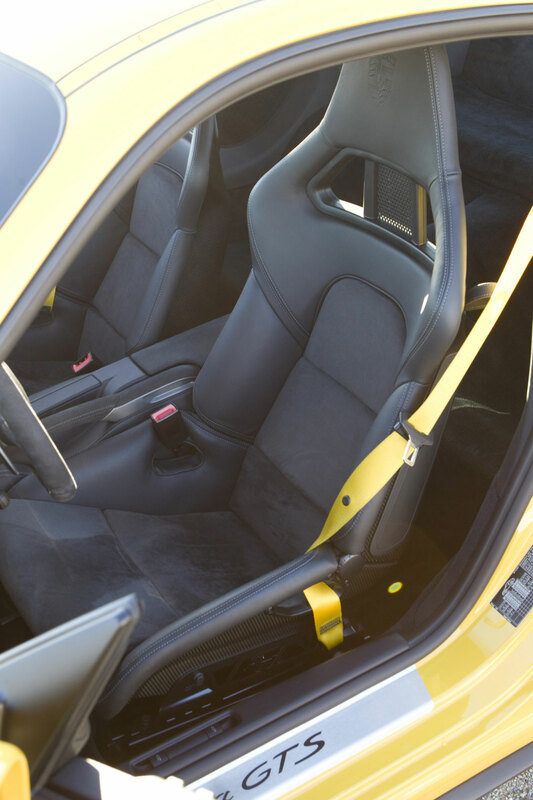 In the interior, there are yellow details and the safety belts have the same color. When I climb into the cockpit, onto the sport seat, I get a mixed feeling. The grip on the soft alcantara covered three-spoke steering wheel suggests comfort, but the firm seat and the awareness of the sport suspension provide different expectations. On the road you can feel the firmness of the car, hard, but not too stiff. The seat is so good, that I could drive to Seattle and back in this GTS, be it in Normal or in Sport mode. The ergonomics are great, with an ideal position of the pedals and a good view at the IP and on the road. A nice gimmick is the knot to in the center console that, when you push it, enhances the engine sound at higher revs. 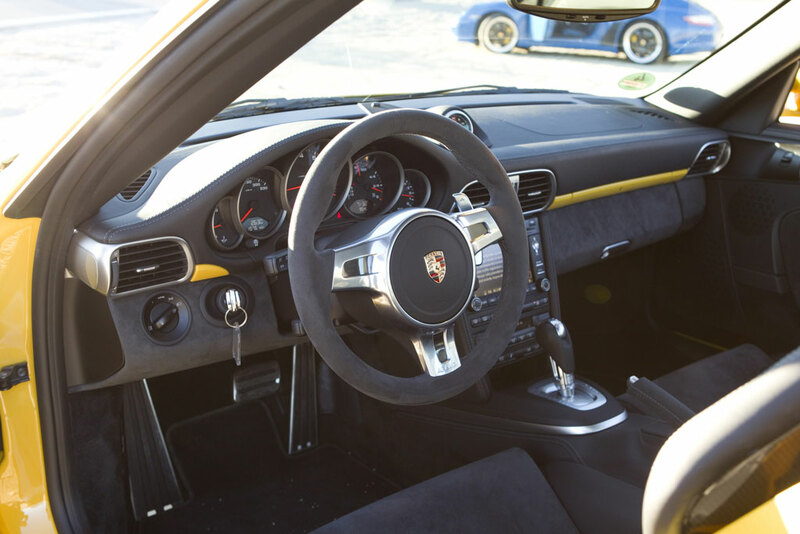 Even though it is typically for the 911, it is always strange when you have to turn the ignition key for the first time: it is at the left side of the steering wheel. But you get used to that pretty soon. The PDK transmissions shifts unnoticed, but you can see what is happening in the display. Both in automatic mode and when you shift with the paddles at the steering wheel, it is absolutely fabulous. The transmission’s soft ware is able to adapt to the driver’s style by ‘sensing’ input on the throttle, not only by sensing the time and force when pushing it, but also the lift. This also applies to the brake pedal. Doug House, the field technical manager for Porsche in Southeast US, says that he has been able to drive in 7th gear at 43 mph and 1,200 rpm, which is the most fuel efficient mode the GTS can do. But as soon as you react aggressively on the throttle, the PDK shifts back to 3rd gear for an optimal set up to take off like a rocket. Well, since this is what I did all the way, the PDK transmission probably did its utmost to accommodate me and shifted faster and better and more aggressive then I would have expected. The engine growls menacing when you bring it to life and hints in the far distance a little bit at the sound of the air-cooled engines. My test-GTS also had a Launch Control-function for fastest possible acceleration from a standing start. It further reduces the acceleration times by 0.2 seconds – to 4.2 seconds. I only had the opportunity to try it once, but could not push the knobs on my chrono watch at the same time…. I am convinced. This is the most sophisticated high performance 911 Carrera ever built. The GT3 is brutal, the GTS is phenomenal. Wish it would have the same price in The Netherlands as here in the US. The Coupe has an MSRP of $ 103,100 but in my country it costs around 150,000 euros, which is about double the US price!